LEIOA 13/04/18 Bizkaiko Txakolina (Txakoli of Biscay) held this morning at the San Mames Football Stadium its Bizkaiko Txakoilnaren Eguna (Txakoli Day), an annual event which serves as the official launch of the latest vintage of the txakoli of Biscay. 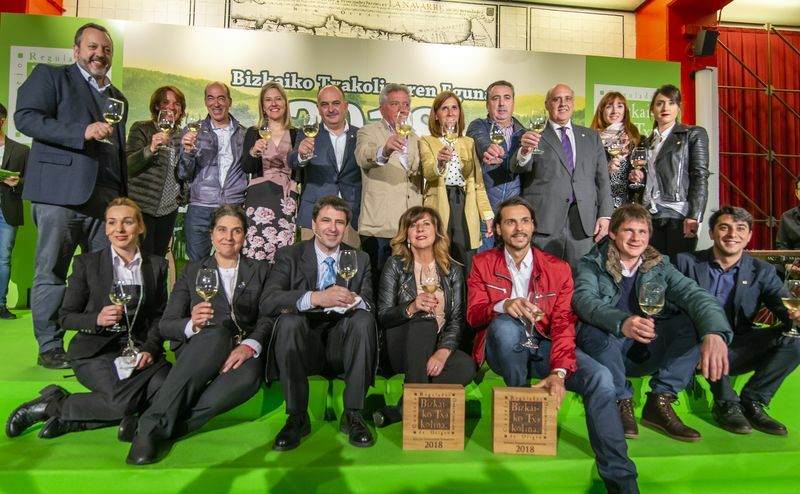 The San Mamés VIP Area was the venue selected on this occasion by the Regulatory Council to bring together winemakers, producers and friends of Bizkaiko Txakolina (Txakoli of Biscay) at its annual event. A total of approximately 300 guests event attended by political authorities and representatives of Biscay society. José Luis Gómez Querejeta made his debut as the new Chairman of the Regulatory Council. The new Chairman highlighted in his speech the positive balance inherited from his predecessors and his willingness to work in order to attain the objectives which have been set by the new decision making bodies of the AOC and that are summarised in the projection of the brand image, the guarantee of authenticity and quality and the promotion and marketing of Bizkaiko Txakolina (Txakoli of Biscay) in new markets. In order to meet these objectives, the team presided over by José Luis Gómez Querejeta advocates in furthering continuous training and research, both in the winery as well as the vineyard, with the endorsement of public administrations, technology centres and universities, as well as with the daily contribution of sommeliers and chefs. The Chairman appealed to the joint efforts and team work of all those who make up the AOC as “walking together will allow us to go further”. Then taking the floor was Peli Manterola, Quality and Food Industries Director of the Basque Government, who highlighted the quality of Bizkaiko Txakolina (Txakoli of Biscay), which must be its passport for a better opening up of new markets. Manterola recalled that in the last financial year exports of Bizkaiko Txakolina (Txakoli of Biscay have grown by 4 percent and promised the active support of the Basque Government both to continue improving the product as well as opening up new opportunities in more markets. Finally, Elena Unzueta, Council Member for Sustainability and Natural Environment finished the round of speeches, who was taking advantage of the setting where the act was being undertaken, made a comparison between the Athletic crop of home-grown players policy and the patient and continuous selection work carried out by the txakolinero (“Txakoli-producer”) sector from the vineyard to obtain a first-class premium quality bottled product, highlighting “the strength of those who knowing that they are small fish in a big pond have the courage to face head on giants, in addition to the pride of belonging to Biscay and the constant pursuit of excellence. After the speeches, the new ambassadors of Bizkaiko Txakolina (Txakoli of Biscay) were named: the dancer Igor Yebra and the actress Maribel Salas, the latter who announced that from now Bizkaiko Txakolina (Txakoli of Biscay) will be present in the television series “Allá abajo”, where she is one of the characters in the series. Three sommeliers, one from each Historical Territory, were responsible for uncorking and describing the Bizkaiko Txakolina (Txakoli of Biscay) of the 2017 vintage. Jon Andoni Rementería, from the Sommeliers Association of Biscay, Nagore Fernández Rocha, from the Sommeliers Association of Alava; and María Herrero, from the Sommeliers Association of Gipuzkoa. In the opinion of these experts, the 2017 Bizkaiko Txakolina (Txakoli of Biscay) is a pleasant, bright and clean wine, with fruity and complex fruit and herbaceous aromas and a balanced acidity, characteristic of its personality. The toast of all attendees, and a musical note, which accompanied the entire event, put an end to that annual Bizkaiko Txakolina (Txakoli of Biscay) event.